With higher average daily mileage, completing this section in 4 days walking is reasonably challenging and ideal for the fit walker who would enjoy the rugged sections along some wild and remote cliff tops. The Dale Peninsula is a walk of contrasts starting in the gentle, pastoral and, in places, wooded shelter of the Milford Haven waterway and ending on the wild and treeless Atlantic coast with spectacular views of the rugged offshore islands of Skomer, Skokholm and Grassholm. Care must be taken to check the tidetables at Sandy Haven and Musselwick to avoid detours on roads. The path then continues to change again as you reach strikingly red low cliffs and coastal slopes and cliff tops rich in wild flowers. In places the red of the Old Red Sandstone is brightly streaked with yellow algae. The pretty village of Solva is well worth a visit due to its situation on an old glacial water melt channel. This section ends in the smallest city in Britain – St David’s and it’s beautiful cathedral. 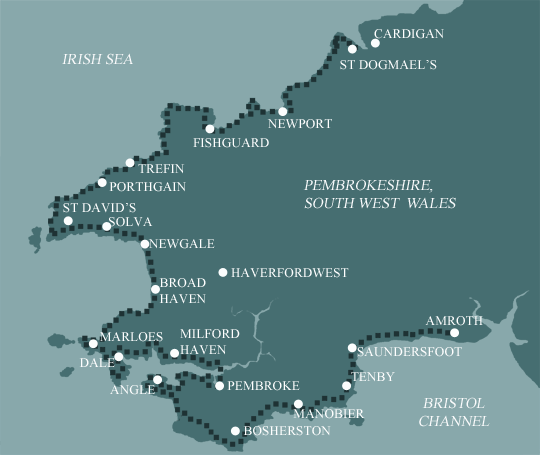 You can extend your day to suit as you can exit the coastal path at various locations round the peninsula to reach St David’s – make time to linger on the wild and rocky peninsular of St David’s Head which abounds with archaeology and has views across to Ramsey Island. Keep an eye out too for seals in the rocky coves below the path and gannets diving for fish out to sea; you may be lucky enough to see the grey dorsal fins of porpoises hunting for fish beneath the gannets. This is not a technically difficult walk and should be easy to tackle for most reasonably fit people. The paths are good, and there are no major route finding challenges. This central sectoin includes a short urban section at the beginning, followed by cliftops and sandy beaches. Terrain: A coastal path mainly through farmland and moorland on the cliff tops, with stretches along sandy beaches. How Much Up & Down? More than you'd think! Although you never reach more than 200m above sea level (and most of the time not more than 100m) there are many short steep sections. Most days involve ascents of 200-500m metres, although no section is very steep for very long. Signposting: Good - the path is well waymarked. Weather: You may be lucky enough to encounter warm, dry weather over the whole route and enjoy dry paths and tremendous views, but you must be prepared because the weather can change quickly. Good clothing and waterproofs are essential, but don't forget you sunhat, sunblock and shorts! Luggage Transport We will transfer your luggage between each overnight stop, if you leave your luggage at the accommodation when you set off in the morning, it will be moved on to your next B&B. You only need to carry a small day sack with the clothes and provisions you require during the day’s walk. General travel information for the Pembrokeshire Coast route will be in your holiday pack including train and bus timetables where available. By Air: The nearest airports are Cardiff and Bristol – International airports are London, Birmingham and Manchester. You can then travel by public transport to Milford Haven. By train from London (5-6 hours) via Newport. By coach National Express from London or Birmingham to Steynton then bus (Provider:First Cymru 302) to Milford Haven (10 mins). By Road: M4 to Swansea, A48 to Carmarthen, A40 to Milford Haven. By Public Transport: Bus to Haverfordwest then Newport for main city links. By Road: A487 to Haverfordwest, A40 to Carmarthen, A48 and M4 for all directions. To the west of the Marloes Peninsula are the islands of Skomer, Skokholm & Grassholm which are brought to life by the thousands of sea birds which breed on the sheer cliffs. All the islands can be visited by boat from Martin’s Haven and guided walks are available on Skomer and Skokholm. St David's is the smallest city in Britain - granted city status by Queen Elizabeth II because of the presence of the cathedral, St David’s is in reality a small attractive village. The Cathedral has been a dominant presence since the 12th century and was a popular pilgrimage destination throughout the middle-ages and indeed remains so to this day attracting thousands of visitors every year. Adjacent to the cathedral stand the magnificent ruins of the medieval Bishops Palace. Boat trips can also be taken to Ramsey Island which is the most northerly of the Pembrokeshire islands and is a wildlife reserve managed by the RSPB.